African states such as South Sudan offer China an attractive mix of natural resources and market opportunities for its own goods. China’s commercial activities also advance its political interests, by seeking increased support at the United Nations and other multilateral institutions. Furthermore, while Western aid and investment typically come with human rights and good governance obligations, China’s economic relationship with Africa has been more transactional, reciprocal, and with fewer strings attached. However, South Sudan’s civil war, and the threat it poses to China’s growing economic and political interests in the country, has now tested the limits of China’s policy—espoused in 1955 by then-premier Zhou Enlai—of not interfering in the “internal” affairs of other states. Indeed, there are many signs that China is prepared to play a more forceful role in defense of these interests. Chinese weapons and ammunition reportedly began appearing in large numbers among South Sudan President Salva Kiir’s troops in 2014. This was presumably done as a means of protecting Bejing’s extensive investments in the face of attacks from ethnic Nuer rebels led by former vice president Riek Machar, who were advancing on strategic oilfields in the states of Upper Nile and Unity. The Small Arms Survey weapons-monitoring group also reported particularly large arms transfers from China later that year. Moreover, for the first time in its history, China has sent a large contingent of combat troops to join a UN mission, with 700 soldiers deployed to Juba in February 2015. China has also taken an uncharacteristically high-profile mediator role, bringing the warring factions together in January 2015 to recommit to an IGAD-brokered ceasefire. There is a strong possibility that China’s more assertive approach to protecting its interests in South Sudan will spread across the continent. Indeed, the South Sudan arms supply was reminiscent of previous deals with Zimbabwe and Sudan. China’s increasing capital investments and personnel in other high-risk countries will require a more interventionist security policy. If this is the case, there could be considerable repercussions for peace and security on the continent. First of all, the human rights, humanitarian intervention, and democratic development issues promoted by the US and its allies could be superseded by China’s interests in promoting economic growth, regional stability, and securing investments and personnel. Whatever political capital is left in Africa regarding the “Responsibility to Protect” doctrine, which elevates humanitarian intervention above state sovereignty if leaders fail to protect their own people, would likely diminish on China’s watch. Another Libya-style humanitarian intervention, which toppled former ruler Muammar Gaddafi, is unlikely to survive a Chinese veto—or a Russian one, for that matter—at the UN Security Council, as we have witnessed with regard to Syria. One reason for this anticipated shift is that the French, British, and US-led military intervention which precipitated regime change in Libya arguably went beyond the scope of the UNSC resolution authorizing “all necessary measures” to protect civilians. Second, African relations with the International Criminal Court (ICC) would likely deteriorate further, potentially leading to an eventual withdrawal from the court by key African leaders. China and Africa share a sense of historical victimization by the West, as well as a deep skepticism of the ICC’s threat to national sovereignty by prosecuting its leaders for war crimes and crimes against humanity. For example, South Africa’s recent decision to allow Sudanese President and ICC fugitive Omar al-Bashir to return to Khartoum, in direct violation of a Pretoria High Court order, reflects not only skepticism, but outright defiance of the ICC project. This anti-ICC movement, with the African Union at its helm, has picked up steam following the controversial indictment of Kenyan President Uhuru Kenyatta and Deputy President William Ruto for alleged crimes against humanity committed during the 2008 post-election violence which left over 1,100 people dead. One way for African leaders to undermine the ICC is to follow Kenya’s lead in giving its political and financial backing to the nascent African Court of Justice and Human Rights, a pan-African alternative to the ICC which grants immunity for sitting heads of state. Such a development would also align with China’s interests in limiting the scope of ICC “interference” in matters of state sovereignty. Third, China’s influence could also be harnessed to better advance African security interests, albeit through empowering more authoritarian leaders like those currently in power in Ethiopia, Rwanda, and Uganda. China’s stable leadership and extensive economic investments in Africa ensure a more long-term commitment to African security and economic growth, as compared with the shifting political priorities and isolationist tendencies of the White House and US Congress in its Africa policy over the last 25 years. China is necessarily playing the long game in Africa in order to protect its investments, which could improve long-term stability on the continent, though at the expense of democratic development. While China is emerging as a power broker in South Sudan, it remains to be seen exactly how it will exercise this power. 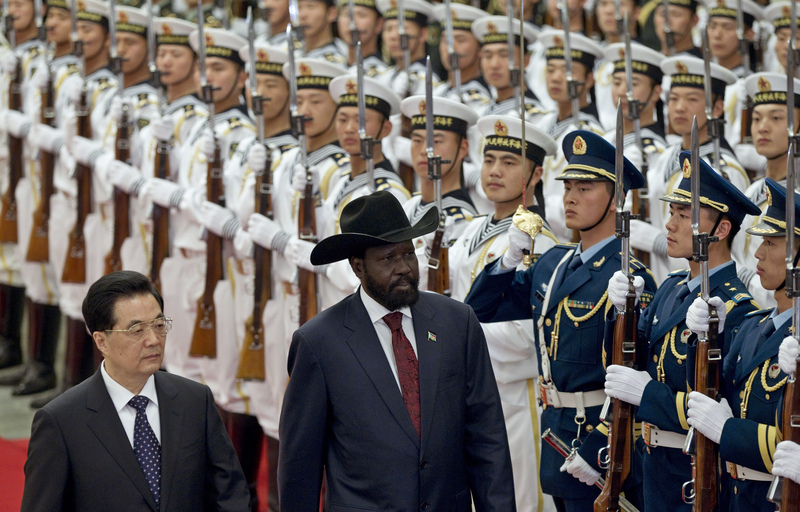 South Sudan’s protracted conflict simultaneously demonstrates China’s more assertive, interventionist security policy as well as the limits of its stabilizing influence. Nevertheless, China is on course to overtake US geopolitical influence in South Sudan and in Africa as a whole, as it seeks to capitalize on its investments, advance its political interest, and ensure the necessary regional stability to do so. China has strategically positioned itself to reap the rewards of “Africa’s century” of economic growth, but must bear the inevitable security-related costs of doing so. How it manages the task could have lasting repercussions for regional peace and stability. All your arguments seem to be logical and I agree with you for a large part. In particular, your third point raises a couple of questions which, in my opinion, would be very interesting: First, is there a chance that China’s involvement in Africa could lead to a better outcome (in terms of stability, poverty reduction, development…) than that of Western countries during the last 60 years did? Personally, I woudn’t be surprised by a positive answer. Great points, Europe and the US have been asleep at the wheel when it comes to the economic potential of Africa (rather than the aid mentality), China is taking advantage of that. “better outcome” depends on how it’s measured – definitely less emphasis will be on human rights, good governance and accountability, but I do believe that the security interests in protecting Chinese investments can lead to a more sustained, consistent, stabilizing presence in terms of overall stability, rather than the American policy that changes with every administration. That said, as South Sudan shows, even China’s influence on that country (including via its close partners Sudan) has proven to be quite limited. Of course, measuring the outcome is a complex issue and choosing the key-indicators strongly affects our judgement. That said, the “emphasis on human rights” of Western countries seems not to have had a strong impact in the last decades of history and politics in Africa – at least not on its direct purpose. I sincerely fear that, looking deeper, that emphasis might result only in political strategy. Hence, assuming that the Chinese influence has the effects you highlight may lead to political and social changes (a friend who has been working in Congo reported that accoring to one of her local partners “the only positive impact westeners had in Congo was developing a strong middle class”). What you said about the limited influence of China is absolutely correct, and reflects the approach chosen by the Chinese, which we could define as a sort of “soft power”, not directly interefering with national affairs. And it’s one of the reasons of Chinese success . Finally, we always forget to mention what India is doing in Africa….